Endowment is greater than the gift. Bishop Otis Kenner II’s new book, The Anointed & The Anointing - Why You Must Know The Difference, ($12.99, paperback, 9781498474733; $6.99, e-book, 9781498474740) guides readers on knowing the differences between “anointed” and “anointing” – and why learning those differences is the key to ministry operations and effectiveness. He stresses that the definitions of those two important words is not one in the same. The book focuses on uncovering the path one is to lead in life. He carefully introduces the idea of being placed in the wrong position in life – by man and not by God – and that is a thought-provoking message that readers can relate to in their life. This book provides a clear understanding to Christians for defining their gifts, placement, and purpose in ministry. Bishop Otis Kenner II Th.D. holds a Doctorate of Theology and has a combined thirty years in ministry. He is a native and lifelong resident of New Sarpy, Louisiana. He has been married to the love of his life, Tyra H. Kenner, for twenty-one years. They are blessed with 11 children and 10 grandchildren. He is the pastor of Fresh Faith Worship Center, New Union Baptist Church, and Greater Mount Pilgrim Baptist Church. He is the presiding Bishop of Kingdom Growth Fellowship of United Churches. He is also an instructor and Vice-President at River Regions Theological College, and a leader and liaison to the black churches for Operation Save America. Xulon Press, a division of Salem Media Group, is the world’s largest Christian self-publisher, with more than 15,000 titles published to date. 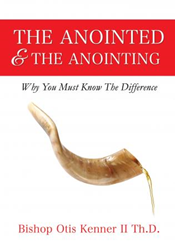 Retailers may order The Anointed & The Anointing - Why You Must Know The Difference through Ingram Book Company and/or Spring Arbor Book Distributors. The book is available online through xulonpress.com/bookstore, amazon.com, and barnesandnoble.com. Media Contact: Bishop Otis Kenner II Th.D.